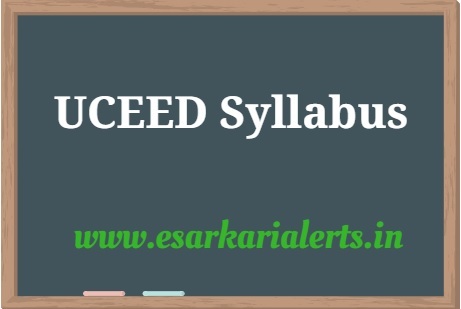 After applying for the UCEED Exam 2018, candidates are searching the UCEED Syllabus 2018 because now, they want to do the preparation of this test. All applicants want to crack this entrance test so that they can get the admission in the Bachelor of Design. It will be possible only when they read properly for the examination. Hence, they want to download the UCEED Exam Pattern & Syllabus. Such applicants can get these all from this page. UCEED is also called as Undergraduate Common Entrance Exam for Design that is conducted to provide the admission to the selected students in B. Des programmes at IIT Bombay, IIT Guwahati, and IIITDM Jabalpur. Many interested and eligible and suitable aspirants had filled the UCEED Application Form. Recently, they want to know about the UCEED Question Paper 2018 that can be checked from the below given section of this page. The UCEED 2018 will be a Computer Based Test and there will be one question paper of Three Hours. The Language of the examination will be English and the paper will be of total 300 marks. There will be three following sections in the UCEED Question Paper 2018. To attempt these questions, students will have to enter a number using a virtual keyboard on the computer screen. There will not be any kind of choice for these questions. For each correct answer, candidates will get 4 marks. If you are worried about the negative marking then don’t worry because there is no negative marking in this section. In this section, each MSQ will have one or more correct answer(s) out of the four given options. Participants will secure 4 marks only if they select all the correct choices. There will not be the negative marking in this section. In this section, each MCQ will have four options out of which only one will be the correct answer. 3 marks will be given for each correct answer. Moreover, there will be the negative marking in this section i.e. each wrong answer will be awarded -1 (Minus One) marks. In UCEED 2018 Exam, questions will be asked from six topics that are mentioned below. The topic wise IIT UCEED Exam Syllabus can be download from the PDF that can be downloaded from the last of this page. After finishing the entire syllabus, candidates are advised to solve the UCEED Previous Year Papers. It will be helpful for them because by doing this they will come to know about their speed of solving the question paper. If you speed is slow then practice to solve the question paper within the given time. The UCEED Question Paper 2016 & 2017 can be obtained using the direct links that are accessible beneath in this article.